So here are some of my current ones. Since I did that Thursday night it has been very very quick and easy to tidy and keep like that because now everything has a place. I swear I am a tidy person in a messy person's body and that applies to weight too. I am definitely a slim person in a fat person's body as I get a shock every time I look in the mirror or catch my reflection in a shop window. It's like Shallow Hal, except I am Hal (in that HE sees her as the slim girl). I see myself slim like Gwyneth Paltrow when really I am far from it... I am the shadow below. In fact that shadow in the pic below bares a scary accurate resemblance to me! Back to the task at hand! Listography! (I have sneaked another simply pleasure in, via the collage and that is the wine o'clock that so many of us enjoy). 2. Time with friends - that connection you get when someone really understands you. When you can be entirely 100% yourself. It is so incredibly important to be able to confide in someone, laugh with someone and say things you couldn't possibly tell anyone else. To be yourself and to feel at ease! 3. Love - it doesn't half smooth out the edges when you love and feel loved. It's like food for the soul. Like a comfy blanket. 4. Tranquility - when you can hear a pin drop. When you can hear your own thoughts. Aaron is still up right now as I write this, but he is watching TV. I can hear myself think. I can hear magic FM playing in the background (from the kitchen) and I am at peace. We had two days in one today and they both involved time in the sun, time outdoors and time with friends. I feel lucky after a day like today. Magic just started playing "Son of a Preacher Man" - I love that song! See tranquil! #bliss (See I have sneaked in another simple pleasure again there. Did you see that?!?!? #Music!!!). Actually I expected Magic's URL to include the letters FM, but they actually HAVE magic.co.uk. I am a little in awe of that actually as you would think that URL would have gone to magic of the card tricks or Wiccan kind......... hmmmm interesting! 5. Health/Wealth - this is something I used to enjoy. I used to have health physically due to teaching yoga and energy, due to super greens, water, diet, etc... and wealth as I was on a good salary when I was a HR Manager. It seems to be my lesson at the moment to see how I can recreate what were these simple pleasures which now seem to be endeavours. I do not have any energy at the moment and am feeling Fat Sick and nearly Dead. BUT I am blessed in that I met Joe Cross, so I will be juicing again, and I have just downloaded (today) this amazing book about water: The Water Diet. I took Aaron to the park today and he was so good on the bus on the way there, that I read a couple of chapters already on my Kindle. So far it is telling me stuff I already knew (that trust me, I needed reminding of) and it has reassured me that health is only a glass of water away. I know I am acidic as I now get heartburn, something I have NEVER been afflicted with. I know fat MELTS AWAY when one is alkaline, and one of the quickest ways of doing it is through drinking the right quality AND quantity of water. IF I can get with-it, I will blog about my transformation. I want my good looks and youthful appearance back :-) Hopefully it is only a glass of water away! I am a tad stupid though, as the book was FREE Thursday and Friday. I went on Twitter and Facebook to tell everyone about it, but then last night at 11 p.m. I tried to download it myself and my Kindle (neglected for months) was still not sufficiently charged by midnight to download it, so I had to do it this morning and pay 1 pounds 85 pence for the pleasure (can you tell my pound sign on my laptop does not work?). Anyway I think the book is worth every penny. I have been getting Ross's newsletters for years and he KNOWS what he is talking about! Actually I have just read the reviews on Amazon so perhaps I should reserve judgement till I read the book in its entirety. Tidy house is something we've always done at bedtime - last job for the kids. It's a great example to set for them later in life. My boys don't really have messy bedrooms - I have no idea how lucky I am. Plastic boxes rule!! I drink tons of water, but perhaps it is the wrong kind? Love the chaos turned to order - I have an OCD streak in me and cannot cope with any kind of chaos! Lovely choices - I'm always in search of tranquility too! I love order and spending time with the loved ones too! Great list and great prompt, didn't know about it, will have to check it out! Loving your simple pleasures, they sound just like mine! I love simple things , it relaxes ones mind. I love the feeling after a good declutter. I'm a bit of a hoarder too so it doesn't happen very often! Great simple pleasures! I love a good declutter too, always makes you feel better doesn't it. I am trying to do toy organisation too at the moment, as it is chaos here too. I am def a tidy person in a messy persons body, I would love to have a show home but so haven't! Is that book really good? Time with friends featured on my listography too, it is so lovely to share stories, gossip and laughs with them. Hmmm, I think I've got a few years before tranquility becomes a simple pleasure. In our home it's that moment before you realise it's too quiet!! I'd love to be organised, I have a organised mind which chooses to surround itself in chaos!! I keep trying to declutter but no matter how much I get rid of it never seems to get any better! Wine o'clock looks great! I too am a thin person hiding in the body of a tubster! I always think I'm my pre-pregnancy size 8, and have a shock when I see myself in photos. This is a great post - I love Wilko too! We have a few of their storage boxes, which are really handy. 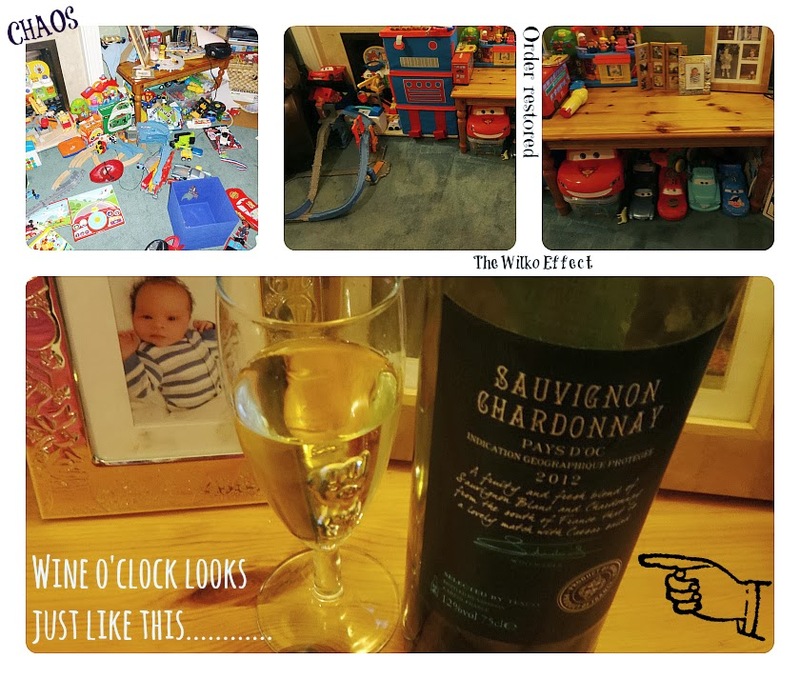 I decluttered our playroom recently too. It had been really tidy then slowly slid into chaos!!! It stresses me out when things are in a mess, so much more relaxing and calming to have it organised. I with you on the rest of your list too, most also applies to me! Our house move was supposed to be a chance to have a major de-clutter but we seem to be acquiring more things rather than getting rid of things! I actually went back to Yoga for the first time in ages last night and I had forgotten how good it makes you feel. Definitely a simple pleasure to hang onto.